Born into a military family Michele's education began in nursing but after receiving her degree (1987), she focused on obtaining her certification as a Substance Abuse Counselor (1992) and then began studies in Behavioral Science at Georgia Military College. 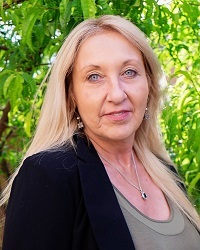 Michele has a Bachelors and Masters Degree in Social Work and an Independent Licensure (2004) which has allowed her the privilege of working with combat veterans from all eras, and First Responders which include Search and Rescue Teams, Firefighters, EMT's. and Police Officers. As an on site volunteer at Metairie Psychiatric post Hurricane Katrina (October, 2005) and aid volunteer to Corn Island Nicaragua (April, 2006), Michele has volunteered to work with victims of trauma, domestic violence, alcohol and drug abuse/addiction. As a Holistic Counselor, the integration and treatment of body mind and spirit is one of the meaningful contributions Michele makes to Odyssey, in it's unwavering commitment to serve the men and women who serve us all.